- Meet in Casablanca then transfer to your hotel in Casablanca. - Our tour manager will revise quickly your holiday schedule. - Overnight in Casablanca hotel. - Morning visit to the historic sighseeing in Casablanca. - Seafood lunch meal in an Atlantic Ocean front restaurant. - Continue for more sightseeing tour to Rabat attractions. - Travel to Rabat for dinner and overnight. - Sightseeing day trip in Meknes & Volubilis. - Transfer to Fez for dinner and overnight stay. - Full day sightseeing trip to Fez hitsoric attractions. - Back to hotel for dinner and overnight in Fez. - Travel to Marrakech via Imouzer, Ifrane & Beni Mellal. - Arrive Marrakech for dinner meal and overnight in hotel. - Full Morning of sightseeing to Marrakech city landmarks. - Afternoon shpping and night tour to relish the city night life. - Dinner under caidal tents in "Chez Ali" restaurant & overnight. - Visit Ait Benhaddou, Tizi N’tichka pass, Zagora & Draa Valley. .
- Dinner and overnight stay in Zagora hotel. - Morning trip to Erfoud & Rissani with lunch in local restaurant. 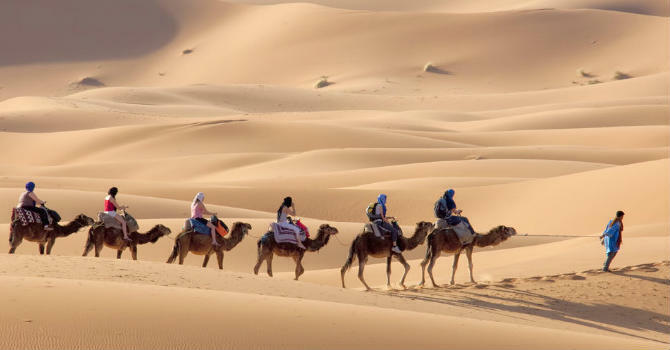 - Afternoon jeep transfer to Merzouga to enjoy sandy dunes views. - Dinner and overnight stay in Bedouine tent “Bivouac”. - Drive to Tinghir via Tinjdad passing by famous Todra canyons. - Lunch by at Todra canyons the continue to the Dades canyons. - Proceed to Ouarzazate via the 1000 Kasbahs road & Dades valley. - Dinner and overnight stay in Ourazazate. - Morning trip to Taourirt, Tifeltout Kasbahs & Ait Benhaddou. - Lunch in the terrace of restaurant facing the Kasbah. - Departure to Marrakech relishing Atlas mountain chain views. - Dinner and overnight stay in Marrakech. - Breakfast in hotel then check out. - Drive to Marrakech airport for the flight back home.